I'll update soon on today's appointment, but to hold you over, here's a pic from today's appointment...now this gown I had on correctly and it definitely looked like a wrap dress. UPDATE: So many things to talk about. Today's appointment went pretty much exactly the way I expected it to. Well, actually maybe not exactly. I have to say Sloane Kettering Memorial Hospital was pleasant and efficient- the office was nice, the intake was zippy, the coffee and snacks appreciated. My mom went with me today- much appreciated. I did some paperwork then got to change into the lovely gown above. A knee-length gown- when do you see those anymore? So, the doctor came in, did a breast exam, sitting and laying down then told me she'd be back to talk to me. We waited a while then were ushered into her office. She said the biopsy got all the affected tissue and "they" (though who "they" is was not explained ever and I didn't care to ask) feel there were no other suspicious areas of the film in either breast. Yay, that was great great news- remember from the other post I was worried about the other white spots. Mommy and I were so happy about that part I think- we both asked again later just to make sure. She recommended either a lumpectomy or a mastectomy. Neither of these surprised me, I have been doing my research. 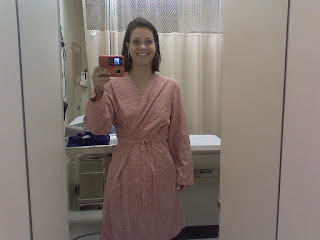 The part I didn't like was her insistance on lumpectomy with radiation. The radiation would occur every day for FIVE weeks. When I questioned her about the possibility of lumpectomy without radiation, her response was a curt "No" followed by a statistic that there's a recurrance rate of 40% without radiation. Now let's get to the parts that I didn't like. I didn't like that whenever I asked a question, she tapped her hands (ala air drum) on the desk. Being a body-language interpreter (novice, of course) I felt this was condescending and inattentive, it also appeared that she was merely entertaining me asking questions. And she was prepared with some pretty stock answers. I asked about this estrogen receptor type of breast cancer and if food had any impact. (Cue air drums). "No." She said my ovaries already produced a ton of estrogen and that food couldn't possibly make an impact. What about the progestrone cream? She was totally against this- I don't recall what she said exactly but dumbfounded shock over a silly suggestion might just be slightly exaggerating her expression. Did it matter that my grandmother's breast cancer was not estrogen-receptive? (drums). "No." I asked about having an MRI of the breast. This is a most curious response. She said that would open up a whole bag of worms- that the imaging would show so much that I would HAVE to have surgery. I think what she meant was that any doctor presented with that data would feel compelled (lest they be considered negligent? I'm guessing) to remove the breast. Maybe that's the reason that 70% of women who have MRIs get mastectomies? She told me about the out-patient process for the lumpectomy and the scar. Not scary, I would be sedated (yes!) and it would take 2 days or so to get back on my feet, though it would hurt for a while. (This biopsy still is slightly bothersome, I can imagine a lumpectomy would be bothersome for months like Aunt Diane's). I know of many instances from what I've read about women having lumpectomies and not radiation. I asked what the bad part of radiation would be- she said a leathering of the skin, a burn like sunburn, and a chance of secondary cancer. She did not know of any instances of anyone actually getting whatever that secondary cancer was. She said too the radiation would affect the reconstuctive process, but didn't elaborate except to say it was still possible. (That means getting a breast implant after the surgery if I chose mastectomy.) The radiation option does not sit well with me. She also mentioned Tamoxifin. She said it's a drug that blocks the estrogen, that it's a preventative measure and not a treatment and that it's rather unpleasant. She described some of the side effects. My mom asked if she was recommending it, she said she wasn't doing anything, just telling us about it. That was a peculiar answer. If I wanted it, I'd go on a FIVE YEAR course of it. HUH?!! Well, that's my story. She told me I could fill out some paperwork today and schedule this for next week. I told her I was not prepared to sign any papers today. I asked about a wait-and-see timeframe- if the biopsy removed the only suspicious calcifications, can we wait 6 months, have another mammography and go from there. No, once you're diagnosed with breast cancer, you should start treatment. Regardless of whatever she said today or how much I liked or didn't like her, it has always been my intention to get another opinion. That's where I'm at now- I'm going to plan for some other information. In the meantime, I'm going to acupuncture on Friday and will also be looking into some natural medicine. It's an enormous amount to digest at this point. The good news is that 1) I am empowering myself to make these decisions 2) I don't have to do anything immediately, I have a little time. Soon, I'll be posting a story about a new friend, Charles, who reached out to me from California. His wife has DCIS and they have so far eschewed surgery. Reading your post today I am trying so hard not to be too attached to your process. However your report of the Dr's seemingly condesending outlook was frighteningly reminisent of our experience. At UCSF Dr. Laura Esserman is running a Temoxifen study for DCIS. She feels that DCIS has been overtreated but still recommends surgery but does not recommend the radiation. Maybe your Dr. should familiarize herself with this study. Other studies have shown that radiation may effect the heart (just behind the breast) leading to heart conditions. The Breast cancer stats look good because the DCIS was stoped but the pacient dies of the heart condition. We can chat more later as I'm at work and want you to know that were thinking of you. More power to you for standing your ground. Be brave you have time to study and choose your own path. When you catch up on your reading I have some other material for you.